Garmin nuvi 2240 sat nav speaks street names and includes street-level road maps for the UK and Western Europe on a 3.5-inch touchscreen display. The slim designed Garmin nuvi 2240 features Lane Assist which directs you to the prefered driving lane and myTrends which recognises your favourite routes, plus ecoRoute to help calculate a more fuel-efficient route. The Garmin nuvi 2240 also features Pedestrian capabilities can be enhanced with optional cityXplorer maps for mass transit information. Optional speed camera alerts and traffic information is also available the Garmin nuvi 2240. Garmin nuvi 2240 has been discontinued. Accessories, spares and parts are still available for your nuvi 2240, as are the road maps. The compact 3.5-inch touchscreen Garmin nuvi 2240 speaks street names and includes maps for Western Europe, including the UK, Ireland, France, Germany, Spain, Portugal and Italy amongst many others. The slim designed Garmin nuvi 2240 features Lane Assist which directs you to the prefered driving lane and myTrends which recognises your favourite routes, plus ecoRoute to help calculate a more fuel-efficient route. Garmin nuMaps Guarantee - simply register your new Garmin nuvi 2240 within 90 days of first using your sat-nav to see if a free map update is available. See map coverage below for more details. With myTrends, Garmin nuvi 2240 recognizes your favorite destinations and over time predicts where you’re going and provides estimated travel time. So whether you’re driving to and from work or a regularly scheduled weekly event, the Garmin nuvi 2240 will help you get there on time. No subscription or added cost required. Garmin nuvi 2240 has an intuitive interface that greets you with two simple questions: "Where To?" and "View Map." Touch the colour screen to easily look up addresses and services and get voice-prompted, turn-by-turn directions that speak street names to your destination. It comes preloaded with City Navigator® NT street maps for the continental UK and Ireland, thousands of points of interest (POIs) and speed limits for most major roads in the UK. Its digital elevation maps show you shaded contours at higher zoom levels, giving you a big picture of the surrounding terrain. With the Garmin nuvi 2240's enhanced user interface, you can slide your finger to conveniently scroll between screens. You also can upload custom points of interest (POIs). And with HotFix satellite prediction, Garmin nuvi 2240 calculates your position faster to get you there quicker. Navigation is just the beginning. The Garmin nuvi 2240 includes many travel tools, including JPEG picture viewer, world travel clock with time zones, currency converter, measurement converter, calculator and more. With photo navigation, you can download pictures from Garmin Connect Photos and navigate to them. With its "Where Am I?" emergency locator, you always know your location. Simply tap the screen to get your exact latitude and longitude coordinates, the nearest address and intersection, and the closest hospitals, police stations and fuel stations. The Garmin nuvi 2240 features Garmin Lock, an anti-theft feature, and is compatible with our free Garmin Garage where you can download custom custom voices and vehicles. Enhance your travel experience with optional plug-in microSD cards. The Garmin nuvi 2240, like all Garmin sat nav's, gets its speed camera data from the Cyclops speed camera database. The database provides advanced alerts to fixed, average speed, mobile, variable, temporary roadwork, red light and red light speed cameras. As you approach a camera, your device sounds an alert. Subscription charges apply. Click here to read more about the Cyclops speed trap database. Do you have a question about the Garmin nuvi 2240 that's not been answered on this webpage? Please see our car sat nav FAQs for questions from other customers and visitors. Plus if the answer to your question isn't featured, use the online form to ask us for the answer. Alternatively please telephone 01733 777623 Monday to Friday (9:30am-5:00pm) to speak to one of our sales team. The Garmin nuvi 2240 has been designed to be plug and play, and as such can be transferred from vehicle to vehicle with ease. The Garmin nuvi 2240 is powered via the supplied vehicle power cable. The Garmin nuvi 2240 then attaches to your vehicles windscreen via the Garmin nuvi 2240 suction cup mount. Alternatively using the supplied dashboard disk you can mount the suction cup mount on top of your dashboard instead. Garmin nuvi 2240 comes preloaded with detailed City Navigator street maps for the UK and Western Europe (22 countries) provided from map supplier here. Rolling screen transition, accelerated map redraw and routing capabilities make screen zooming even smoother and ensure the navigation always matches your pace. Further Garmin nuvi 2240 maps are available SD card which insert directly into the Garmin nuvi 2240. 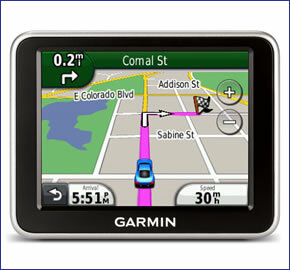 Available Garmin nuvi 2240 maps include North America, Australia and New Zealand, Middle East and Southeast Asia. Garmin nuvi 2240 maps. Looking for accessories and spares for the Garmin nuvi 2240? All parts are genuine Garmin product and specifically designed for use with the nuvi 2240. Accessories available to purchase include the GTM 36 traffic and vehicle power charger, suction cup mount, a weighted dashboard mount and mini USB cable. Looking for sat nav maps for the Garmin nuvi 2240? All mapping comes on microSD card with SD card adaptor and is genuine Garmin product and specifically designed for use with the nuvi 2240 Countries available to buy include: UK and Ireland, France and Benelux, Full Europe, North America, Australia and New Zealand.